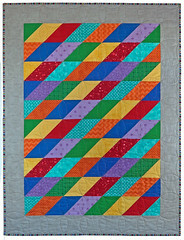 I rave a lot about how, with Whimzie Quiltz, your custom quilt design can be exactly what you are looking for. What sometimes get lost in that message is that the size can be customized, too. When DeVon D. needed a quilt exactly 55″ by 75″ to fit the bed in her new teardrop camper, we came up with this colorful, fun arrow quilt that perfectly fits! DeVon already had a purple fleece blanket with little retro campers on it that she wanted her custom quilt to complement. The arrows in the design (inspired by Cluck Cluck Sew’s One Way pattern) give a subtle nod to travel, but the overall look here doesn’t compete with the campers on her existing fabric. This may be one of the most colorful quilts I’ve ever made. Picking out the rainbow of colors – two fabrics for each shade! – was a delight. Placement was a little harder than I expected. My first attempt at completely random color placement didn’t really pan out. But once I developed a repeating pattern that looks random (but isn’t), it all came together. The quilting was extra fun on this one, too. When I started, I just liked the mix of straight and wavy lines and thought they’d emphasize the arrow shapes. If you look closely, though, it ended up looking like a sweater! Just adds to the comfy-ness, doesn’t it? I like to think of this as giving fabric scraps another chance to fulfill their purpose And, as a lap quilt, it’s not too big, so hopefully she can find room in the camper for it, as well. The first quilt is named “Adventures Await” so, of course, I went with “Mini Adventures Await” as the name for the lap quilt. Hopefully, both will keep what she’s calling “Granny’s Glamper” extra warm and happy during her exciting travels. 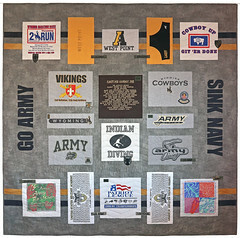 Want your own quilt that’s perfectly sized for a hard-to-fit space? 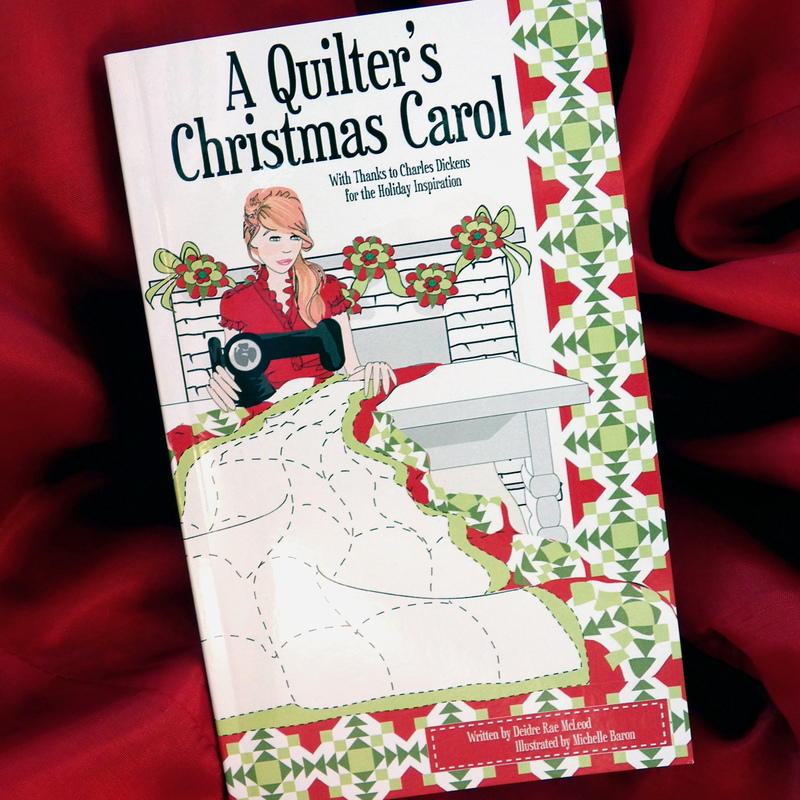 Visit Whimzie Quiltz today to learn more! I’m super excited to debut 14 NEW quilted holiday countdown calendars for 2018 available now in my Etsy store! Last year, I created a Harry Potter / Quidditch themed advent calendar in Gryffindor colors. This year, I realized I need to give the other Hogwarts Houses a little love. Cast a summoning charm on the holidays with these quilted Harry Potter / Quidditch themed advent calendars and have a very merry – or is that “very Harry?” – Christmas. 150 points to Slytherin if you catch this Advent calendar by Dec 1! 150 points to Ravenclaw if you catch this Advent calendar by Dec 1! 150 points to Hufflepuff if you catch this Advent calendar by Dec 1! There’s lots to love about the Charlie Brown Christmas animated special, but the opening song “Christmas Time is Here” is especially charming. That’s why I chose the lyrics as the sentiment for this Peanuts Advent calendar. Features an embroidered Charlie Brown Christmas tree – all it needs is a little love. Here’s one way to make your holidays tree-mendous! In the hustle and bustle of the holidays, do you often find yourself asking how many days are left until Christmas? Make sure you never lose track by counting down with this whimsical quilted Christmas tree Advent calendar. Features an adorable embroidered Christmas tree surrounded by cheery presents. 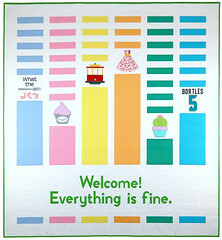 OH… MY… GOD… could this be any more perfect for friends of Friends? You remember the Holiday Armadillo, don’t you? He’s Santa’s representative in all the Southern states and Mexico and he’ll be there for you all December long with the Holiday Armadillo Advent calendar. Features an embroidered armadillo “wrapped” in a giant red bow under the phrase “Merry Christmas and Happy Hanukkah”.